As you know, I’m pretty hot on the idea of resilience, so it’s a huge pleasure to be able to announce that I’m the official coach for Stopcocks Women Plumbers – a UK-wide organisation of female plumbers which has recently launched a national franchise scheme. Stopcocks is the brainchild – and passion – of Hattie Hasan, a former schoolteacher turned plumber turned visionary. 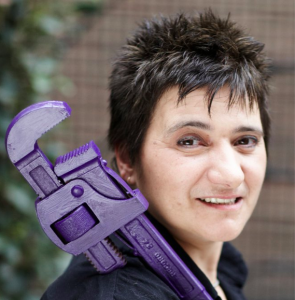 She founded Stopcocks to ‘change the way women view themselves and each other – and to shake up the construction industry’, but more importantly to give women a chance to follow the career they want and give customers the choice to have a female tradesperson working in their home. But she admits that founding and sustaining the company has never been easy. First of all there’s the problems of getting into the industry in the first place. There’s all the issues that get in the way – like the pressures on teenage girls to confirm to the ‘norms’ when they choose their careers. So many of the women wanting to train as plumbers are older – already having family commitments and probably a job they need to maintain while they are training – so flexibility is key to their success. And when women do train – then they’re often employed by large companies who take women because of equal opps, and those women are often working as part of a team so aren’t exactly visible. Stopcocks Women Plumbers is all about making self-employed women plumbers visible, Hattie says. Then, there’s the whole thing about dealing with other people’s limiting expectations. Hattie says that so often it’s assumed that women plumbers will just do the easy jobs – being helpful to grannies and vulnerable people – but not up to the heavy (and often more interesting work) that male plumbers undertake. So it’s important to keep challenging those misconceptions. That’s why Stopcocks’ website makes it clear that their plumbers are capable of designing and fitting major installations. Although installing my utility room was probably a doddle in comparison, Hattie certainly gave that 100% commitment. It’s certainly the first time I’ve had a tidy, unobtrusive plumber in my house who listened to quiet classical music while working – and checked regularly that she wasn’t disturbing me. And there was no leaving early or taking a break because some piece of work proved more exacting or fiddly than anticipated. Hattie wasn’t satisfied until the work reached her exacting standards, and she was quietly finishing off and tidying up after herself while I was cooking a meal for visitors… And yes, I did ask her to stay and eat with us. Which was definitely a first for me.